Hiller Aircraft Corporation was founded in 1994 by Jeffrey Hiller (son of the founder of the original Hiller Aircraft company) and a consortium, to repurchase assets from Rogerson Hiller Corporation. First flight January 1995 of the UH-12E5 five-seat helicopter, and June 1995 for first newly built UH-12E3. Current production is believed to center on the piston-engined UH- 12E3 three-seater and the UH-12E3T turboshaft variant. I'm wondering if any of you old timers knew Fred Jamison. I worked for him for a few years and understand that he worked for Hiller in test and sales. Sorry to say, Fred passed a few years ago. At times he seemed like a brother. Flew the UH-12E in Alaska for Mapco mining company. What a work horse, not mention extremly stable. am i right on thinking,on these the paddle bar is attached to the outer gimbal ring, where the rotors are attached, so when the bar tilts it alters the direction of the rotor disc,what iam saying is the blades do NOT feather cyclicly, only collectivly.....Am i right??????? Nice bird! Whats the price tag? No landing gear, instruments, etc. It is now flying as an E/4 and is painted as shown in the photo above. 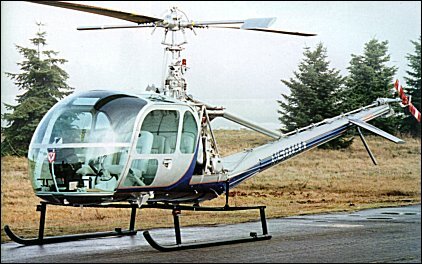 In 1993 the Alaska State Troopers acquired 3 UH-12's from govt. surplus. They were added to a fixed-wing fleet that ranged from 3 Grumman Goose, to about 20 Super Cubs and many Cessna bush planes. The state shop overhauled the Hillers and equipped them with NightSun lights. The crew consisted of a State pilot, an Anchorage PD observer and a State Trooper observer.We flew the Hillers in a program similar to LAPD. Anchorage has about 1/2 the state's population. Lots of SAR's, backup for APD and AST ground units, and several arrests for traffic and criminal offenses by hailing the driver to the side of the road and landing to make the apprehension. The limitations were fuel range, top speed of about 90 KT. We loved the sturdy little ships but a medevac requirement arose and we traded them on 2 JetRangers after 3 years. I currently own this aircraft. I bought it from the Hiller factory in a 4 place configuration. It had been stripped of all running gear and was only a cabin and tailboom with glass and seating installed. No landing gear, instruments, etc. It is now flying as an E/4 and is painted as shown in the photo above. I graduated fron the U>S. Army school in Class 61-2W. I have almost 4500 Hours in OH23s rom the C to the E. One fine aircraft. I was one of the pilots on the hot weather test for the FH1100. I personally thought it was the best. I would love to fly again.